Planning to build on the wave of enthusiasm for bike commuting generated each May by Bike to Work Day, transportation and health advocates in Silicon Valley are promoting a spin-off called Bike to Shop Day on Saturday, May 17, to encourage people to shop by bike at local businesses. Retail businesses offering discounts to bicycling customers are shown on a smartphone-friendly map on the event’s website. organizers expect many more to sign up in the three weeks remaining before the event. Any retail business located in San Mateo County or Santa Clara County that can offer some type of discount to customers who arrive by bicycle is eligible to participate. Shoppers are encouraged to upload photos of their bikes in action — carrying groceries or other items — to win gift certificates and other prizes. Lafleur, a marketing professional who writes two urban cycling blogs, Bike Fun and One Woman, Many Bicycles, called for a National Bike to Shop Day last month to promote shopping by bicycle. She came up with the idea after it became clear that Mountain View was simply disregarding the need to improve access and parking for bicycles as part of expansion plans for the San Antonio Shopping Center. But national transportation surveys show that more people use bicycles for shopping, recreation, and visiting friends than for commuting to work. In San Francisco, five times as many residents ride a bicycle at least once per week for non-commute trips than for commuting. Since residents have more and closer choices for where to shop than where they work, bicycling is usually a viable option for shopping even when bike commuting isn’t. Organizers are also promoting the economic benefits of investing in infrastructure that attracts customers who prefer to shop by bicycle — a market segment that has grown as more residents are relying on bicycling for transportation in Silicon Valley, where expensive housing leaves little money for families to spend on cars, and busy work schedules leave little time for exercise. “We’re delighted to support this event, to show our local businesses that it helps the bottom line when customers can easily reach them by bike,” said SVBC Executive Director Corinne Winter. 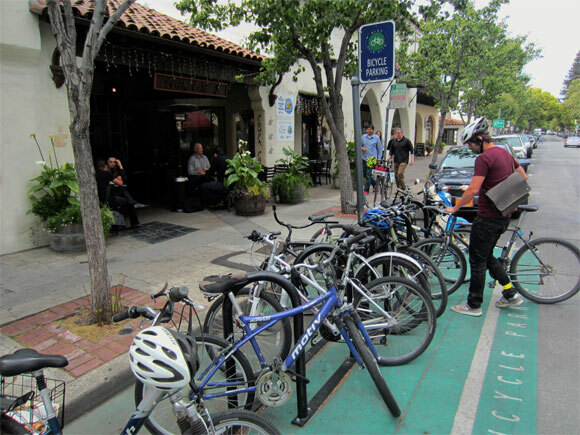 By providing participating merchants with some potential new customers who bicycle instead of drive to their stores, advocates hope to both reduce demand for car parking and increase support for policies that make bicycling for shopping trips practical, such as adequate bicycle parking and quality bike lanes on streets leading to the many downtown business districts in San Mateo and Santa Clara counties. 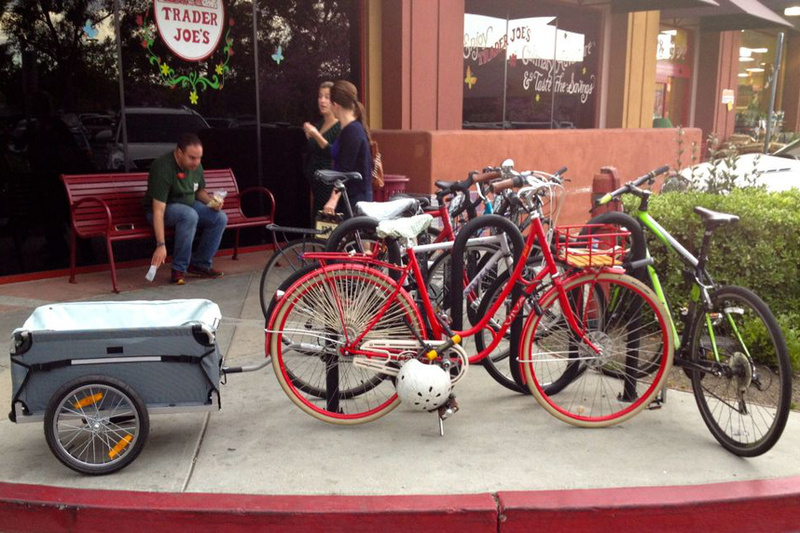 “When local merchants can see that a large part of their customer base arrives by bicycle, they’re more likely to support continued improvements that will attract even more bicycling customers,” said Adina Levin, in charge of strategy and media promotions for Bike to Shop Day. Projects that convert travel lanes or car parking to bike lanes or bike parking corrals can shift some car trips to bike trips, which benefits local businesses in two ways. Customers who rely on bicycles for transportation tend to make more frequent shopping trips and spend more money in aggregate than driving customers, and since bike parking is more efficient than car parking, the same amount of space can accommodate more customers. Bike to Shop Day organizers are still looking for volunteers to help recruit more businesses to participate, and to lead group bike rides to popular shopping destinations on May 17. Monday starts Bike Week in San Mateo and Santa Clara Counties. And Thursday, May 11, the Silicon Valley Bicycle Coalition (SVBC) brags that "tens of thousands of regular and first-time Bay Area residents will bike to work for the 23rd Annual Bike to Work Day."